Have received parcel back this afternoon and have finally been able to sit down and open it and have a look at the repair to our Christening Gown. I was so excited but wanted to wait until the children were all in bed. It has actually brought tears to my eyes!! The gown looks absolutely beautiful and as perfect as it could do for 120 years old, you have done miracles with it, I am so happy with it! The bonnet is my favourite and the most beautiful perfect match, I knew if anyone could match it up you could but I was not expecting it to match so brilliantly, your work is truly exquisite Linda!! The stunning petticoat is the final beautiful finishing touch and I am so glad I decided to have it too. I love how you have matched the back of the petticoat to the gown with the same sort of ribbon ties. I can't thank you enough for all your superb work and for making our family heirloom last for many more years to come, I know that my children's children can still carry on using it and that makes me very happy. You truly have a great gift for what you do and I shall recommend you very highly to anyone who may require your services at any point in the future!! Cleaning your gown, using a variety of techniques that are not usually available at your local dry cleaner. A wide variety of fabrics and textiles can be restored to their former glory. If you would like to discuss the restoration or repair of your gown please do not hesitate to contact us. We have never been beaten yet! This christening gown has surely been the most challenging project to date. 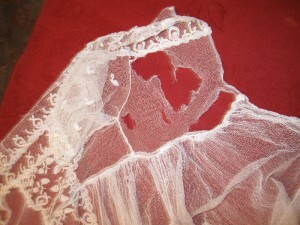 When the gown arrived, I opened the box to find a silk gown in a very bad condition. 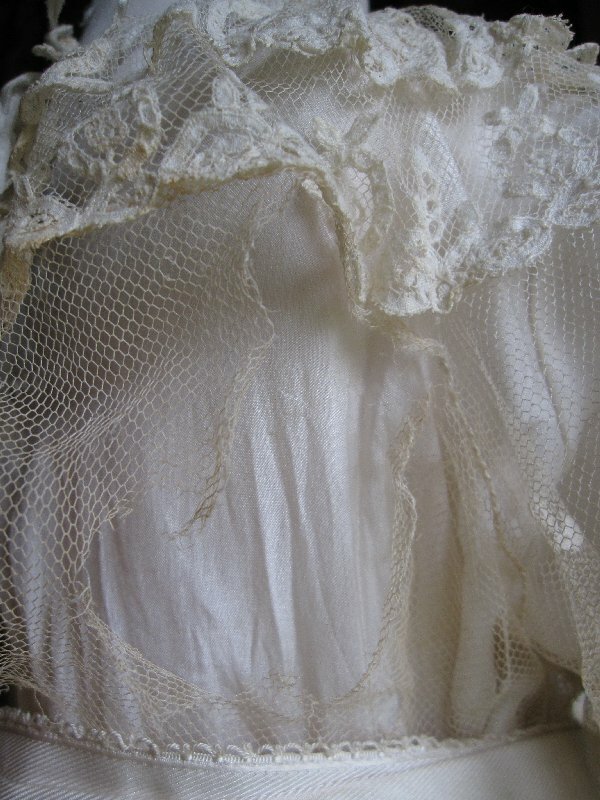 It was in much need of a clean and the netting was severely torn and damaged. But here was a really beautiful gown, simply waiting to repaired. Firstly the gown needed to be cleaned. It was so fragile that it could only be cleaned using the most delicate of processes. Several weeks later and the true colour of the gown emerged! Next the netting overskirt was removed from the silk gown. The netting was beyond repair so identical antique silk netting was sourced. A new bodice was created and carefully stitched to the existing bodice, once done, the orginal bodice was removed. 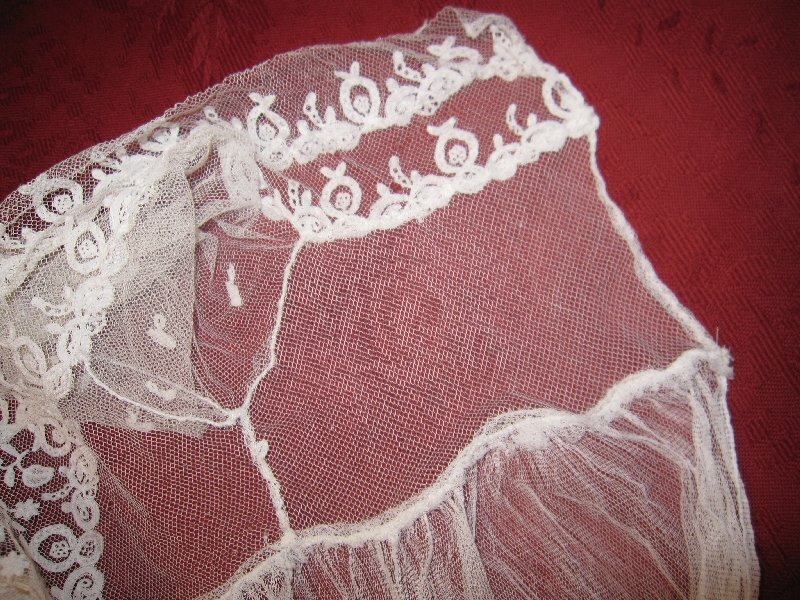 The overskirt could not be replaced as the lace was irreplaceable so the tears were carefully stitched together with tiny stiches. The underskirt was darned where necessary. Finally the net overskirt was reattached to the underskirt at the neck edge. Loops were created at the sides for the waistband with its dramatic flower to slip through to ensure that the weight did not pull the bodice down. The Brookes Christening Gown was a delight to work on. 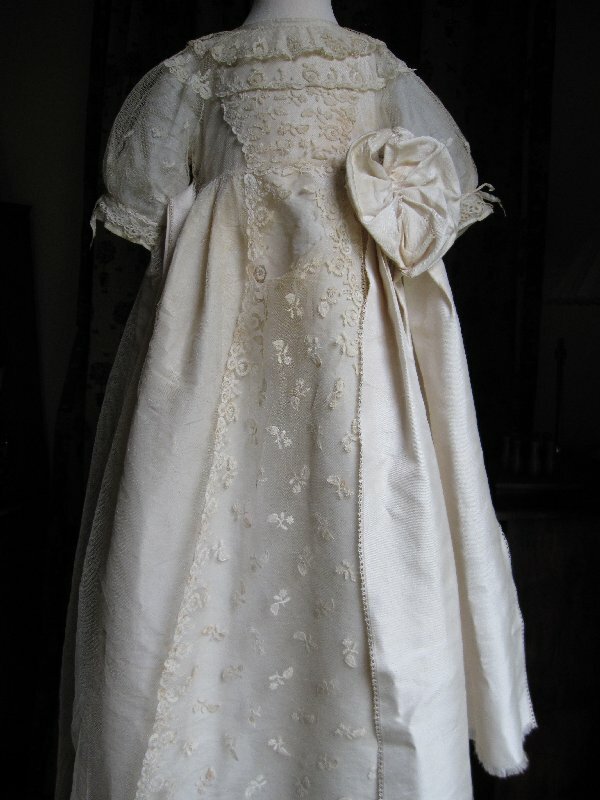 From telephone conversations with Susan it was easy to realise that this gown was a treasured family garment and I felt extremely honoured to be trusted to repair it. This Victorian gown had quite a few problems. The bodice had several tears which needing darning but as well the fabric was extremely fragile and in order to protect it, strips of cotton lawn were sewn with tiny, tiny stitches to the back of the bodice to reinforce the delicate lace panels. There was a large tear to the front of the skirt which was darned and again all the lace panels were reinforced with fine cotton lawn to strengthen. Finally a long soak in a solution of natural products brought the gown back to stunning white colour. 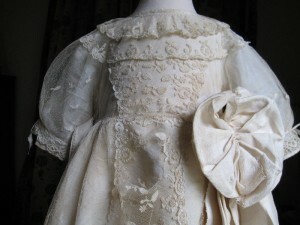 This christening gown was Edwardian in style and had a lovely embroidered skirt attached to a dainty bodice. Sadly there appeared to be a moth attack on the skirt - many (a few large ones) were clustered up the front. The repair could have been undertaken in two ways, simply darn the holes or remove the damaged area. This second option was agreed. The skirt was fairly wide and the look of the gown would not be lost if the skirt was reduced in width. First the skirt was removed from the bodice. The damaged area of the skirt was removed. This was approximately a three inch wide strip of fabric. The skirt was joined back together. The skirt was then rotated so that the new seam became a side seam and the original back seam also became a side seam. The skirt was then stitched back to the bodice using the "gauging" method as per the original join. Some small holes remaining on the skirt were carefully darned. 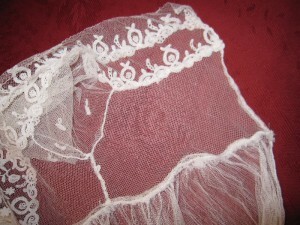 Some lace in the bodice was also darned. 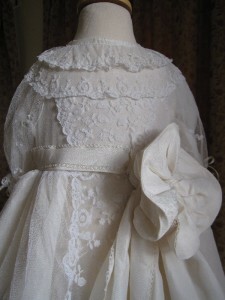 Finally a petticoat was created to go underneath the christening gown.